All computer programs, excluding firmware, require an operating system to function. 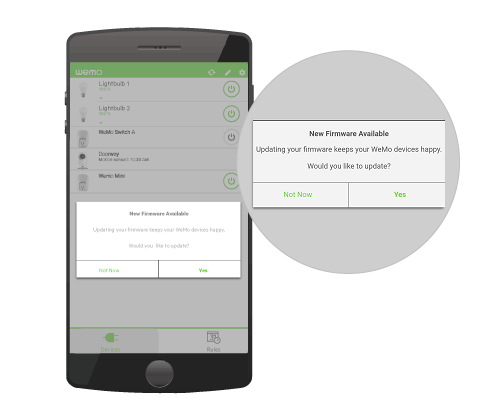 Updating your Wemo® device's firmware to the latest version keeps it running smooth and gives you one less thing to worry about. 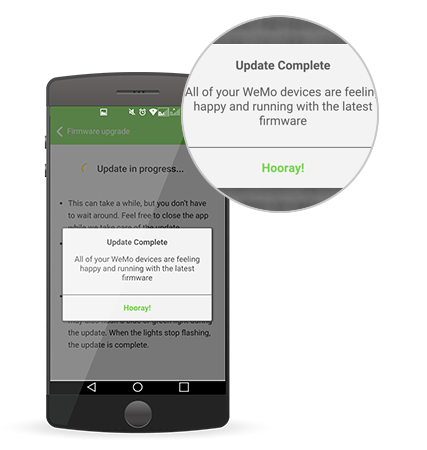 New firmware releases are posted on the Wemo Firmware Server. Your Wemo reaches out to this server daily and compares your current firmware version to what is the newest on the server. If an update is available, a pop-up message will appear on your Wemo App to prompt you to install it. IMPORTANT: If you are using the Apple Home app with your Wemo Mini, you must continue to update the firmware of your Wemo devices through the Wemo App when a firmware update is available. Your Wemo App should be up-to-date. Click here to download the latest version from the App Store®. For Android™ users, click here. Your Wemo device or devices should be properly set up. For more information, click here. Additionally, if your Wemo Mini has a HomeKit code, you can set it up with the Apple Home app. If your Wemo Mini does not have a HomeKit code, you will need to set it up with the Wemo App. To know how, click here. 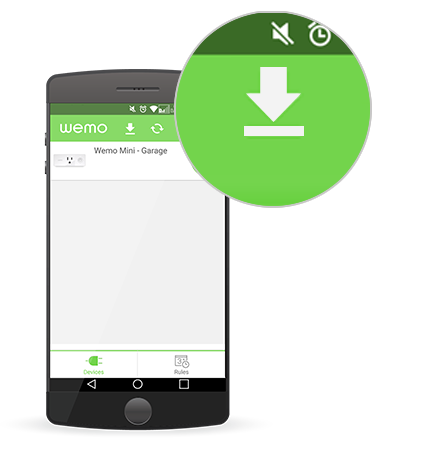 NOTE: Wemo App images may vary depending on the device (iOS or Android) being used. If a firmware update is available, you'll be prompted by a pop-up window. Tap Yes to proceed. NOTE: If you select Not Now, the pop-up window will appear again after 24 hours. On the Devices section, tap on the Download icon at the upper portion of the screen. NOTE: Skip this method if you have an iOS device. On the upper-right corner of Devices section, tap the icon for Android devices or for iOS devices. 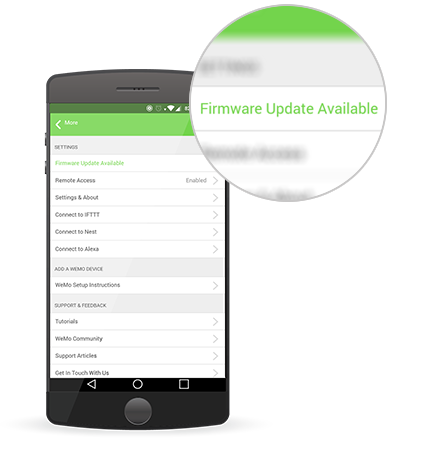 Then, select Firmware Update Available and accept the update after reading the release notes. Step 3: The Firmware Upgrade screen will display the information of the device you're about to update. Click ACCEPT & UPGRADE. Step 4: The update will begin. 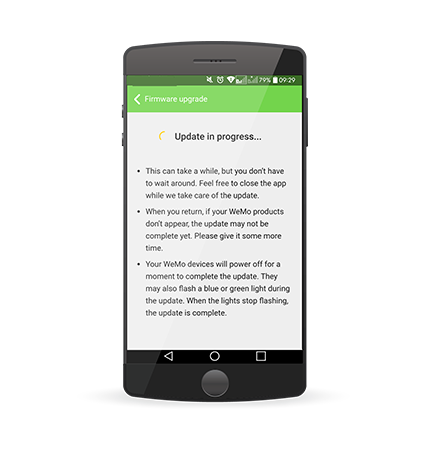 During the firmware update process, the light on your Wemo device will begin to blink. When the update is complete, you will see a pop-up message. Tap Hooray! and your Wemo device will reboot. 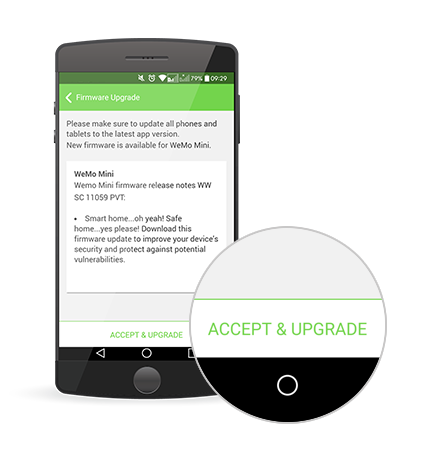 You should now have successfully updated your Wemo device.